(ii) another address, if any, where the solicitor believes the copy is likely to come to the client’s attention. (e) if the client is not a corporation, the text of subrules (8) and (9). (b) serve a notice of intention to act in person under subrule 15.03 (2). (ii) the court hearing the appeal may deny the client the right to be heard. “property” means personal property and includes a debt. 1. In the case of an application or motion for an interpleader order under subrule 43.02 (1), each person who makes a claim in respect of the property. iii. each person who makes a claim in respect of the property. (ii) is willing to deposit the property with the court or dispose of it as the court directs. (2) A claimant who is entitled to do so under subrule 60.13 (4) or (5) may seek an interpleader order (Form 43A). 1. If no proceeding has been commenced in respect of the property, the person shall make an application naming the claimants as respondents. 2. If a proceeding has been commenced in respect of the property, the person shall make a motion in the proceeding on notice to the claimants. 3. The notice of application or notice of motion shall require the claimants to attend the hearing to substantiate their claims. iii. is willing to deposit the property with the court or dispose of it as the court directs. 1. The claimant shall make a motion, on notice to the other claimants, in the proceeding in which the writ of execution was issued against the debtor. 2. The notice of motion shall require the other claimants to attend the hearing to substantiate their claims. (c) order that the costs of the applicant or moving party be paid out of the property or its proceeds. (g) make such other order as is just. (3) A motion for an interpleader order that is made to a master and raises a genuine issue of fact or of law shall be adjourned to be heard by a judge. (e) to award costs to an unrepresented party. 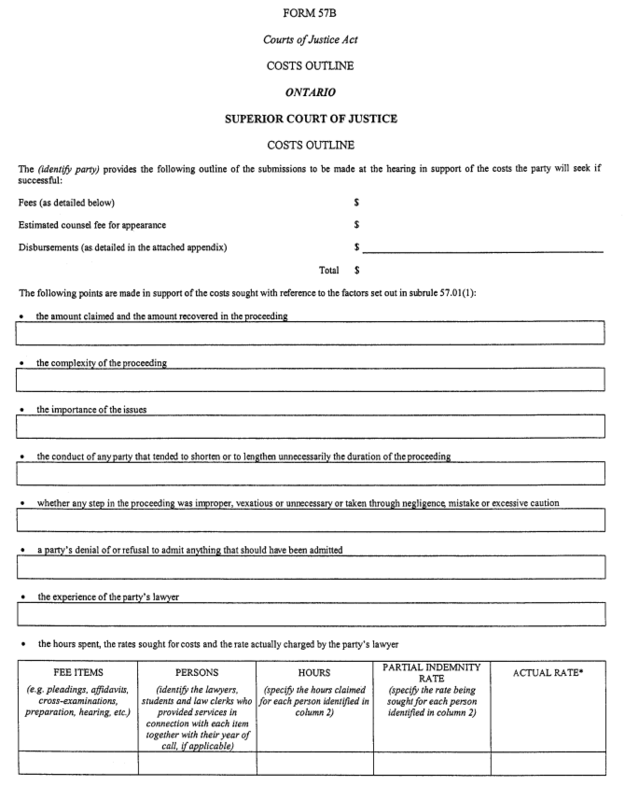 (6) Unless the parties have agreed on the costs that it would be appropriate to award for a step in a proceeding, every party who intends to seek costs for that step shall give to every other party involved in the same step, and bring to the hearing, a costs outline (Form 57B) not exceeding three pages in length. (7) The court shall devise and adopt the simplest, least expensive and most expeditious process for fixing costs and, without limiting the generality of the foregoing, costs may be fixed after receiving written submissions, without the attendance of the parties. 5. Form 15B of the Regulation is amended by striking out “formerly acting in person”. The fee for any step in a proceeding authorized by the Rules of Civil Procedure and the counsel fee for motions, applications, trials, references and appeals shall be determined in accordance with section 131 of the Courts of Justice Act and the factors set out in subrule 57.01 (1). Where students-at-law or law clerks have provided services of a nature that the Law Society of Upper Canada authorizes them to provide, fees for those services may be allowed. 8. This Regulation comes into force on July 1, 2005.